In this section, we’ll learn about each of these user roles, the differences between each one, and the best way to manage your users. Account owner user accounts have the highest level of authority and do not have any restrictions on what they can do or access inside Dragon Metrics. Account owners are also able to access and manage account and billing information. New user accounts can be designated as Managers to be given more access to all levels of the Dragon Metrics account. This role is useful for users who need a great deal of control of the account, and may be in charge of managing other standard or read-only users. This role is often used for account managers in agencies or department heads of organizations. Managers can create new campaign and new standard and read-only users, but cannot create or manage other managers. 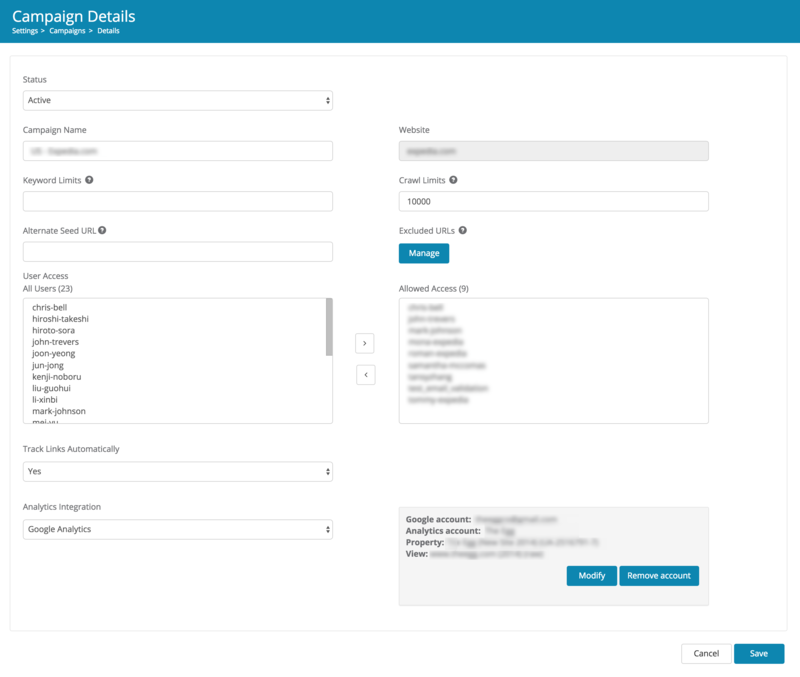 It’s also possible to assign a manager access only to certain campaigns in the account. Once they have access to this campaign, they can manage all settings of this campaign and are able to manage standard and read-only users who have access to this campaign. However, if they do not have access to a campaign, they cannot manage the standard or read-only users assigned to this campaign. This role is for users that do not need to make any administrative changes to the account (such as adding or modifying campaigns or users), but do need to create and manage reports. A standard user cannot manage any campaigns or users, but they can create new keyword groups, run backlink reports, manage links, and other campaign-level functions. Standard users can be given access to specific campaigns, and withheld access to others. This is useful to give certain employees access to only clients they’re working on (in an agency) or business units or websites they’re a part of (in an enterprise). This user role is very similar to standard user. The only difference is that while standard users can change campaign data (such as add keywords, run backlink reports, create alerts, etc. ), read-only users can only view reports and other information. They will not be able to run their own reports or manage campaign data. This user role is often useful when giving access to clients (for agencies) or stakeholders outside your department that may want to view reports, but don't need to create them themselves. All user roles have the ability to manage their own user information. For example, they can change their name and Email address associated with the account, change their password, edit their Email preferences and more. This can be done by going to My Details, and then clicking on the user account you are currently logged in as. Note: No user role is able to delete their own user account. Only the account owner or another manager can delete another user's account. Account owners cannot be deleted. Campaigns are the reports and tools in a campaign, such as Rankings, Overall Comparison, Backlink Discovery, Link Management, etc. The account owner's account can access all campaigns’ campaigns, while other user roles can access campaign campaigns that they have been granted access. If a user have been given access to a campaign, they will be able to access the campaign’s campaign by selecting it in the campaign selector. If they’ve not been given access, they will not see the campaign in the campaign selector. Managing a campaign’s campaign means they can add/edit/delete information in a given campaign. For example, if a user is able to manage a campaign’s campaign, they can add new keywords to a keyword group, change the search engines tracked, add new competitors, run new backlink discovery reports, edit link information, etc. If a user does not have manage rights, they will be able to view, search, filter, and export the data, but they will not be able to make any changes to it. All user roles except for read-only can manage campaign data they are able to view. Both account owners and managers are able to manage users. This means they can view, edit, add, and delete user accounts. 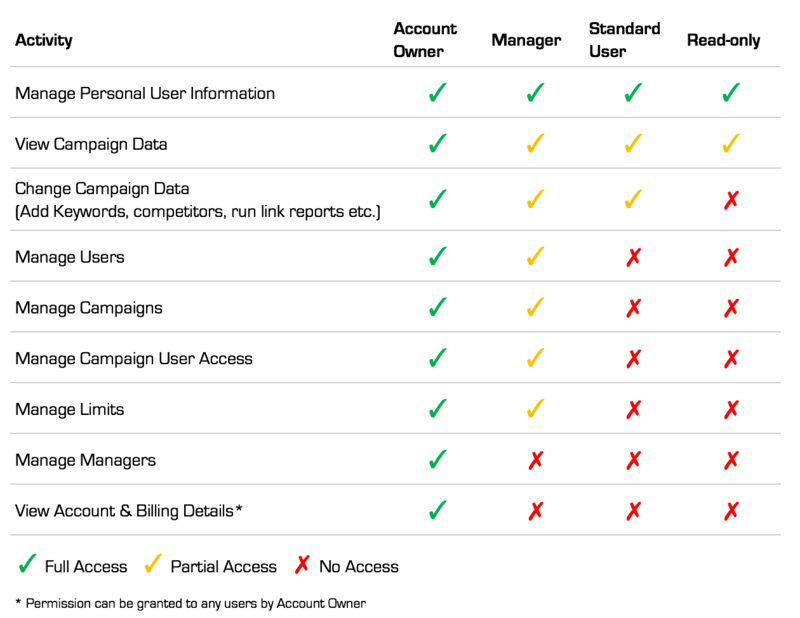 While account owners can manage all users, Managers are only able to manage standard users and read-only users assigned to campaigns they have access to. Michael, John, and Mary are managers. Michael has access to campaigns campaign A and campaign B.
John has access to campaign B.
Mary has access to campaign C.
Tom, Smith, Larry, and Andy are standard users. 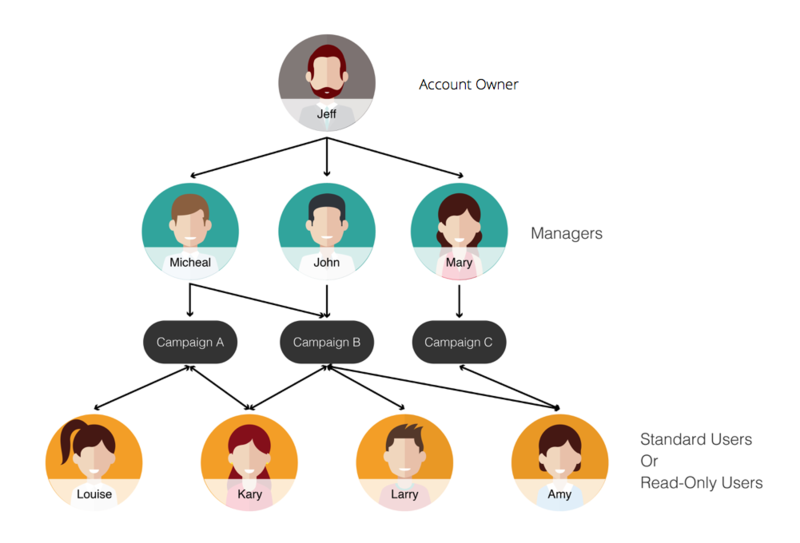 Managers can manage users under campaigns they have access to. 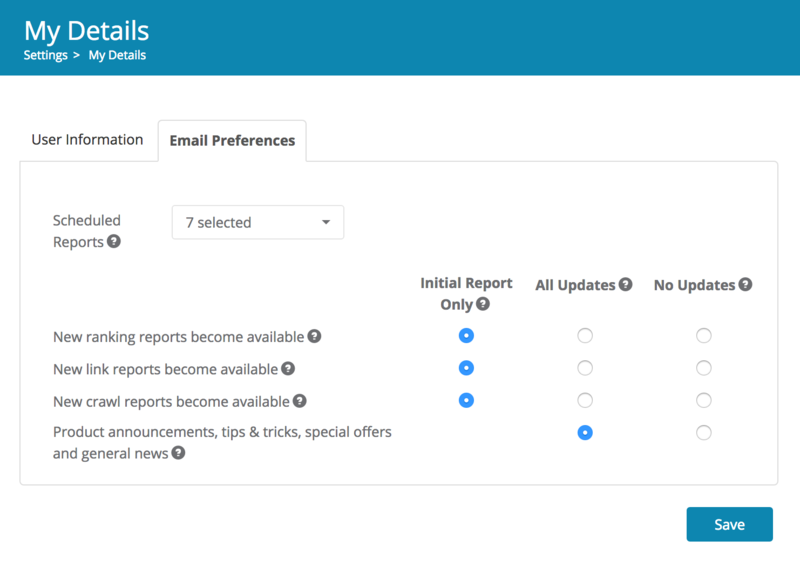 Managing campaigns allows you to view, add, modify, and delete campaigns. This includes changing a campaign’s name, changing its status, managing user access to the campaign, changing the campaign website, keyword limits, crawl settings, adding analytics integration, and other campaigns settings. Account owners have access to manage all campaigns in the account, while managers must be given access to a campaign to be able to manage it. Standard users and read-only users cannot manage campaigns. 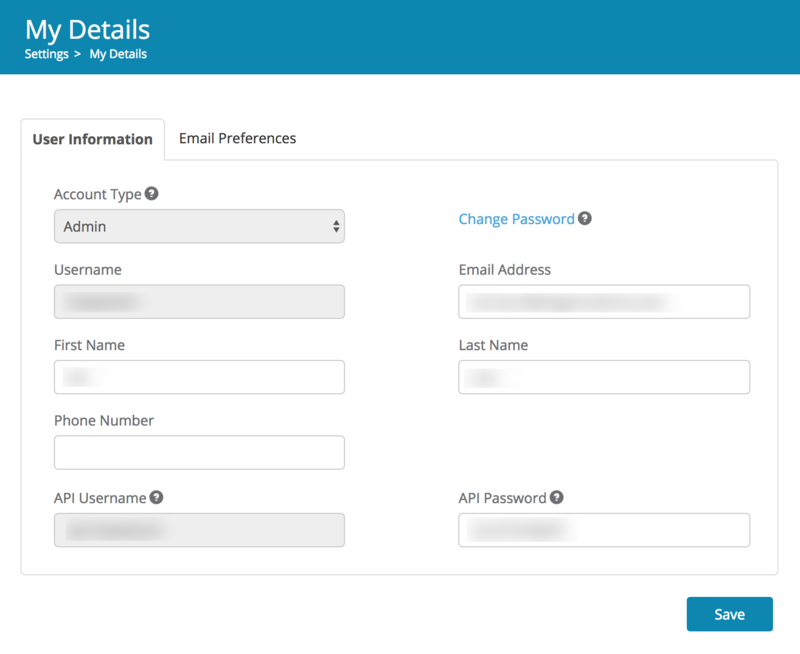 Account owners and managers can manage campaign user access. This means they can control which users are able to access each campaign. This is done on campaign details page by selecting a user from the list of all available users in the account, and moving them to area on the right using the arrow. To remove a user's access to a campaign, simply select the user (or users) you'd like to remove access for, and click the left arrow. Multiple users can be selected by holding down shift and clicking (for groups of users next to each other), or by holding ctrl and clicking (for individual users). Account owners can manage the keyword / crawl limits assigned to each campaign in the account. Managers are able to manage limits only for campaigns they have access to. Limits can be managed either on the Campaign Details page, or the Manage Keyword Limits page. Only account owners can manage other other managers. This means that when a manager goes to the Users page or the Campaign Details page, they will only be able to see standard users and read-only users. 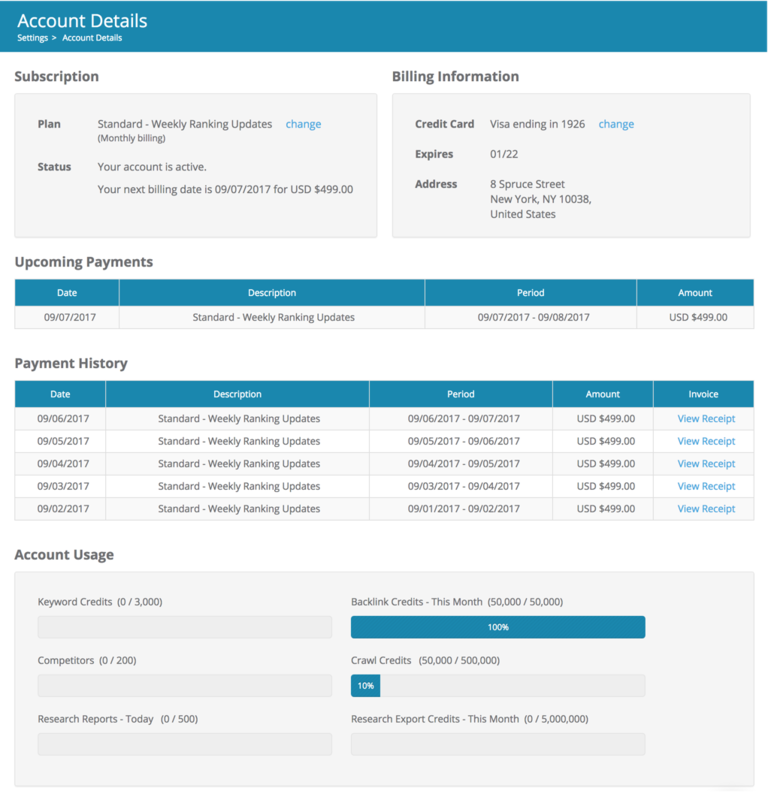 Account Owners have access to the Account Details page, where they can view billing information and other important information about their account. 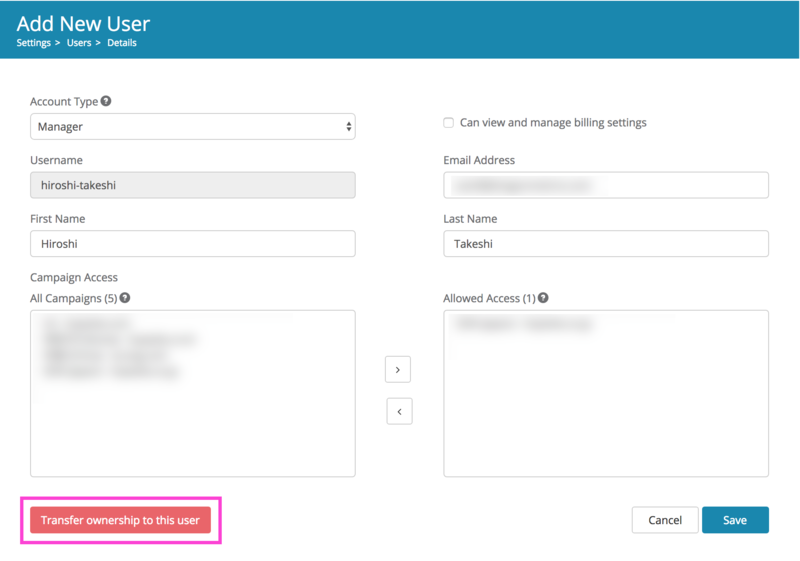 Other users can be given access to this area if the checkbox "Can view and manage billing info" is checked when creating / editing users. The Account Details area can be accessed via Settings > Account Details.